Rain began to fall slightly harder shortly before the race eventually got underway and pole-sitter Tom Chilton was the first to be caught out by the conditions at the first hairpin. Chilton’s Ford Focus RS slid wide, as did a series of others, and it was absolutely frenetic action as everyone fought for position. When the positions were eventually settled it was Smiley leading from Matt Simpson’s identical Honda Civic Type R with a gaggle of cars headed by Colin Turkington in behind. Another accident down the order and another safety car period followed, but it was soon the AmD MG of Rory Butcher making ground. 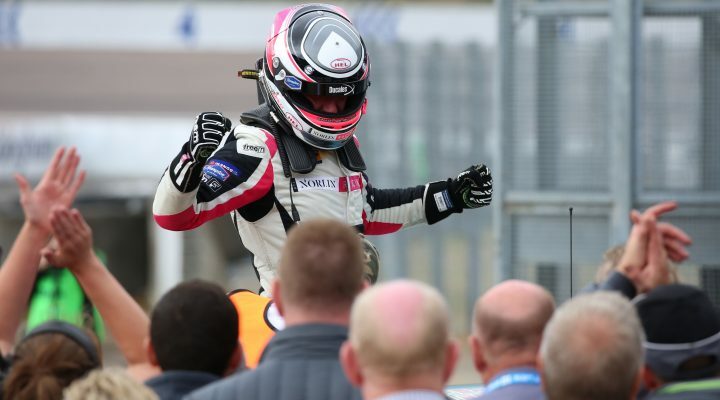 He’d already attacked for the lead before being shuffled back by Simpson and Turkington, but the Scotsman fought back by the latter to move into the podium paying positions. A setback struck Butcher on lap ten, however, when he too was caught out by the tricky conditions and ran his MG6 wide through the hairpin – losing three places in the process. The podium eventually came down to the final run to the finish line as Simpson lost second to Turkington through Brook and then got caught by Motorbase man Sam Tordoff, as well as Tom Ingram’s Speedwork’s Toyota. In a dash to the chequered flag it was Simpson who got the nod by just 0.029s. Butcher recovered to finish sixth, ahead of the brilliant Bobby Thompson in seventh. The VW driver produced an eye catching performance and made outstanding moves by Adam Morgan’s Mercedes and Ollie Jackson’s Audi to claim his best result. Halfords Yuasa Racing’s Dan Cammish completed the top ten on what was largely a difficult day for the multiple champion Honda squad. Post-race attention, however, quickly turned to Northern Irishman Smiley who has impressively taken his first win in dominant fashion. In terms of the championship shake-up, Turkington had sneaked back by Speedworks Motorsport’s Tom Ingram with a four point advantage with just three events remaining. “That was excellent,” enthused Turkington. “I wasn’t feeling so confident on the grid with the rain falling. That’s where we tend to be weakest. I decided I’d go for it and try and get on the front foot and be aggressive but it was ultimately a race of patience for me. We had the speed in the car and it was about picking the right moment.